As you know, most countries outside of the United States use coins instead of bills for all but the largest denominations. For example, the Euro has up to a â‚¬2 coin, and the first bill is â‚¬5. That’s contrary to the U.S. where our coins are only fractions of a dollar and all dollar increments are bills, except for the few times the Treasury has tried to introduce dollar coins (like now). In Israel, where we recently visited, the Israeli New Shekel (also spelled sheqel) has coins up through â‚ª10 (10 shekels). That’s around $2.50 at the current exchange rate. But while in Israel, I found one of the major problems with using coins for higher denominations. While many would argue for the coin’s longevity compared to paper/linen bills, I would argue against the coin’s ability to get lost more easily! Here’s my story: I was walking out of a shop after buying some postcard stamps in Tiberias. 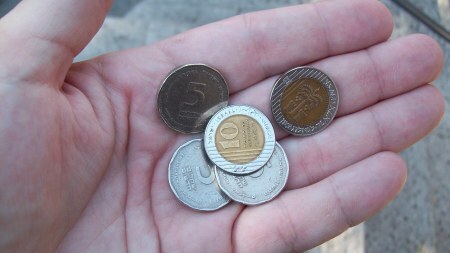 I had a few coins in my hand (like those pictured above), including some 5 shekel pieces. As I closed my hand to put the coins in my pocket, a five shekel piece fell out, bounced on the wooden deck once and fell cleanly through the floor boards. Even if there was room to go under the deck (there wasn’t), I wouldn’t have dared to try given what other kids of garbage and muck probably existed there. Well, there went about $1.30. But if it had been a 5 shekel bill (which doesn’t exist), it wouldn’t have fallen through the boards. It may have blown away, but I could have chased it and probably caught it. So the basic problem with using coins instead of bills is their ability to get lost. But perhaps it’s just a problem for stupid Americans who aren’t used to handling change of such importance. Here, if we drop a few cents, it’s not as big of a deal because they’re only fractions of dollars (I mean this in relative terms. I know every cent counts). But throw some $1 or $2 coins in our fists, give us a few weeks to get used to them, and we’ll start making sure we have a better handle on them before storing them in our old lady coin purses. Yes, I foresee all Americans carrying around those little plastic oval change holders if we switch to dollar coins. For you Europeans (or other world travelers), how do you handle your change? Is keeping track of the coins a problem? Do you carry little coin purses or just throw them all in your pockets? That’s a pretty weak argument. Mostly because as soon as people know the coins in their hand may have more value they will be more careful to pay attention to what they do with them. Also, think of the value of the coin jars on peoples counters everywhere. When you empty your pocket each night in to your coin sorter to roll, or a coin container you’ll end up with wads of cash. It happens to me all the time (Canada, $1 and $2 coins, $5 starts bills). I also rarely lose coins. You just get used to it, but you what I’ve noticed is that one tend to value less a coin than a bill. The wallets in Germany, and I believe in the rest of Europe, tend to be slightly larger than ours, 1 due to the wider and variability of dollar shapes and 2 for the coins. All of the wallets I’ve gotten in Germany (for male and I’m assuming for female as well) all have had change pockets. As someone who has always lived with higher denominations in coins and is used to them, I loathe the dollar bill when I am in the States. Mostly because they fill the bill fold section of my wallet and leave me feeling that I have more money than I do. The fact that they are always twice as ratty looking as any other bill just adds to my dislike. I keep my change in the change section of my wallet, my partner keeps his in his pocket- neither of us has ever had any issues. Also I agree with Traciatim, if you collect your change you are likely to collect the dollar coins where you would not deposit dollar bills, which can amount to a nice sum very quickly. I don’t spend cash often, and I only carry a money clip. So I always have a few bills with me, including $1 bills. I don’t want to carry any change with me. I think the odds of us cutting the dollar bill is about as likely as us dropping using both the penny and the nickel. They both make sense to some, and could be justified, but there would be too many that don’t want it for it to happen. At least then we would know he has a sense of humour. @Traciatim: Would he put his picture on the new coins that would be minted? I doubt it, don’t you have to do something monumental and commendable to have that honour? Who was that guy who sold your country to teh central banks? Couldn’t you put him on there? When I lived in England, I kept all my coins in the (small) coin pocket of my (American) wallet. What made this practical was that prices there are always quoted with all taxes included. So if I was at a store buying only a small number of items, I would add up the prices in my head and have exact change ready, so I didn’t accumulate masses and masses of excess change like I do in America. Or, even if I didn’t know the exact total in advance (if I was buying something by weight, say), since many small purchases require only coins, I would only have to open the coin pocket to get both the right number of pounds and the right number of pence. In contrast, in America if I’m paying cash for something that costs, say, $9.73, I have to get out a $10 bill regardless, and I’m usually too lazy to take the extra step of searching through the coin pocket to get out three pennies. So here, I keep a change jar for all the extra pennies I keep getting, whereas in England, I never had to do that. A big advantage I see for large-denomination coins is that it’s easier to pay bus fare with coins than with bills. Have you ever taken the Metrobus home from Dulles or BWI and had to wait behind enormous hordes of non-SmarTrip-wielding tourists trying to feed three dollar bills each into the fare box? That’ll take a while. the best thing australia did was get rid of 1 + 2 dollar notes, and getting rid of 1+2 cent counts, round all to nearest 5cents. I dont know why the US loves 1$ notes. I hate them, they make my wallet buldge. Oh my, another pun . . . Stu . . . “I dont know why the US loves 1$ notes . . . ” It’s because they fear change of course. I didn’t have as many issues with losing my dollar coins when I was abroad. What I found out though, was that it’s so much easier to lose track of them and use them more frequently. It’s harder to budget and see how much you are spending with dollar coins. We are so used to spare change and just kind of dumping it and not taking it seriously. I had that mentality abroad and would use dollar and in Europe 2$Euro coins like it was nothing. Of course it adds up very quickly. You are less likely to use dollars than coins. In New Zealand we use coins at 10c, 20c, 50c, $1 and $2. Then notes are $5, $10, $20, $50 and $100. The $1 and $2 coins were introduced within my lifetime, at the same time that 1c and 2c coins were removed. Within the last five years, we’ve also lost the 5c coin. Although I wasn’t old enough to care when $1 and $2 notes became coins (heck, 50c was still a lot of money to me back then), I can’t remember anybody being terribly upset at the change over. As one commenter has already pointed out, most wallets sold over here have a built in change purse (even guys wallets) and in a society that relies mainly on plastic (EFTPOS… not quite sure if that’s what its called in the states) if we’re heading out on the town and don’t want to worry about change we just take our cards in our pockets – problem solved. â€œI dont know why the US loves 1$ notes . . . â€ Itâ€™s because they fear change of course. Hahahaha you made my night. Thank you! the reason americans love the dollar bills is because they help put girls through medical school. I’m used to it. The denominations of our coins (1p, 2p, 5p, 10p, 20p, 50p, Â£1 and Â£2) mean that you normally need fewer coins to make a given sum than with US denominations, so we actually don’t carry as many as you might think. I generally have less than Â£3 in coins on me at any one time. Coins are much better for vending (etc) machines, don’t get as dirty, and are generally very easy to tell apart – once you get used to them. Not only are they more prone to get lost, think of the extra weight you would carry around if you have a significant amount of money in coins, as opposed to bills. @ Nick- ah, the weight argument- this always appears in these discussions. I think if the weight of the change you are carrying is causing issues you have to either get better at mental arithmetic and start counting out coins to pay with or take yourself to a gym for a little workout. I’m fairly scrawny and unfit but have never felt like my dollar coins were weighing me down! How about the argument that I don’t want them in my pocket banging into my cell phone face, pda or mp3 players? I already cut back on how much I carry because I simply dislike carrying anything extra in my pockets. The first day of hiking, there were a few rest stops where the locals set up selling drinks, snacks, and rain ponchos. While adjusting my jacket, a 5-sol coin (about $1.65) fell out of my pocket. Before I had a chance to figure out where it had landed, one of the wizened locals swooped in, snatched it off, and cackled gleefully to her friends at her great fortune. I figured that in addition to being the poorest people I’ve ever seen, these descendants of the Incas must also have a pretty mercenary finders-keepers policy!